Jalandhar: World’s best and largest multistate cooperative society in India, the ‘Indian Farmers Fertiliser Cooperative- “IFFCO” and Lovely Professional University hosted 1500 Farmers’ Meet today at Shanti Devi Mittal Auditorium of LPU. Occasion was massive organization of “Golden Jubilee Year Celebrations” of IFFCO’s foundation by its Jalandhar Zone Unit at LPU Campus. Held with ‘Corporate Social responsibility’ fervour, the programme proved entirely dedicated to agriculture, farmers & cooperative development. Top two leaders of ‘IFFCO’, Managing Director Udai Shankar Awasthi & Chairman Balwinder Singh Nakai met each and every farmer and member of the cooperative society present on the occasion to encourage them for further mutual progress and development. LPU School of Agriculture took keen interest in making farmers understand the latest trends developed in agriculture and agricultural education. 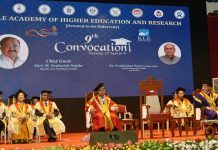 In a message, LPU Chancellor Mr Ashok Mittal conveyed that the farmers are real backbone of the country and LPU wants to ensure that agriculture sector keep on progressing by leaps and bounds by absorbing latest technologies and scientific methods. Mr Mittal expressed that LPU is lucky to be able to connect with a large number of farmers and in updating them towards the betterment of agriculture and agricultural studies on latest trends. Dean Mr Ramesh at LPU School of Agriculture informed all about various scientific and organic methods being applied and taught at LPU to bring revolutionary changes in the agriculture. LPU students made brilliant cultural presentations, for the farmers’ large audience, which mainly carried theme and glory of farmers and farming. On this occasion, an exhibition was also organized at LPU campus to brief farmers about Plants, seeds, compost, fertilizers, production, sales, financial help, joint ventures and many more. Near 100 illustrious and hard-working farmers and members of the Jalandhar zone were also honoured for their great contributions in the advancement of agriculture in the region and the country.